As you walk into the pub you may be slightly shocked to find that the entire bar is shaped like an old wooden galleon. All manner of nautical items hanging from the ceiling. Excellent beers on offer from the Wye Valley brewery based a few yards down the road. They tend to sell a couple of beers from the Wye Valley brewery across the road and now have their own brewery, the Spinning Dog, which has been brewing since January 2000. They usually have a couple of guest beers on offer too. The atmosphere is friendly and the clientele ranges from office workers at lunchtime to literally anyone in the evening. The pub also has live bands too. Not too sure about the food that they do these days but I've heard that they do do evening meals though only on weekdays. 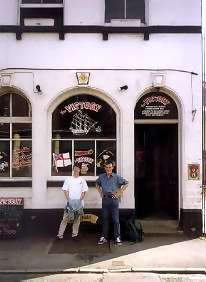 UPDATE on the Victory in Hereford care of Nigel Bevan of Shrewsbury and West Shropshire CAMRA. Spinning Dog is now a 10 barrel plant, Jim Kenyon, brewer and landlord, has really done the brewery side up with a modern 'easy to clean' look to the interior.